Social media tool highlight: Ditto is the visual search tool for marketers to see how their products appear in social media photos. There's Buffer, IFTTT, Hootsuite and any number of other great apps with which to import copy. Use anything, just stop using Twitter as a Facebook feed! Many people are at a loss when it comes to Twitter, because they're getting more visual features on more popular networks. It's often the done thing to tie Facebook and Instagram together, but Twitter is too often on the end of a social media strategy, neglected because "let's just link to our other accounts and increase our Facebook fan base." Everyone forgets that Twitter is a community in its own right, while also being a feed just like Facebook's News Feed. You're competing against the Tweets above and below yours, so you'd best make an effort to get noticed. Linking to competing (and frankly obligatory) social networks with automated text doesn't help your case. Because it's boring and gives no incentive to follow. 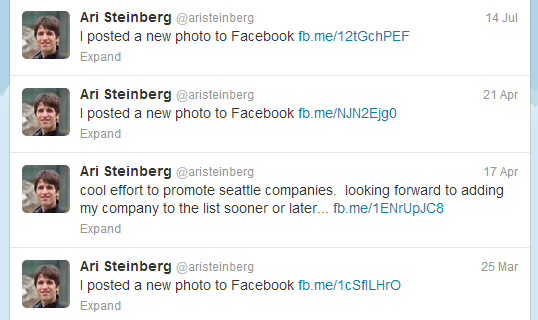 On Twitter, @aristeinberg is a former head of Facebook's Seattle office. I've never met Ari or followed him, but since Facebook uses his account as an example, so will I. The problem with this is firstly, it's spammy and poor Tweeting. Your audience has no idea what these photos are while the auto-copy is so non-descriptive. And frankly, you're missing out on a much larger audience, because a lot of people won't follow Tweets like these, let alone retweet them. You may get a Facebook fan out of it, but your Twitter account won't grow at all. On the matter of directing people to Facebook to view images, why not post to Twitter as an image? Research suggests that Tweets using Pic.Twitter.com are 94% more likely to be retweeted, and Twitpic gains 64% more of a chance - but as for Facebook and Instagram image links? 47% and 42% LESS likely to be retweeted respectively. Ew! And have you even seen how Twitter images appear these days? BAM! They take up the whole width of the Twitter feed when viewed at the website. Granted, some mobile and third-party desktop applications don't have this great an impact, but for a large chunk of users, this is their experience. Cut off that feed, pronto! Head to your Twitter settings and visit the left sidebar link to Apps. You'll get to the list of applications with access to your account. On Facebook you can visit facebook.com/twitter and unlink your account there. But what do I post on Twitter? That depends on your strategy and call to action. Even if you do want people to follow you on Facebook, your Twitter account is part of an entirely separate community with (most likely) different members. Remember the 80-20 rule. If you want to invite people to a party, you wouldn't go on and on about that event everywhere else in town would you? No! You invite people once or twice in between useful and entertaining discussion in the present environment, asking questions and getting to know them. In this sense, up to 90% of your content should be useful, engaging messages which prove to others that you're the genuine article who makes an effort. Facebook links don't show this, not by a long shot. So give it a go! You'll get a more varied, interesting Twitter feed and your followers will thank you for it. If you want help with your social media strategy, be sure to get in touch.